In the USA alone, it is estimated that 2 billion gallons of fuel are wasted each year due to low tire pressure. Fuel consumption is increased when driving on underinflated tires. More fuel consumed = more emissions released into the atmosphere. The DOT estimates that 57.5 billion pounds of added carbon emissions are emitted into the atmosphere from driving on low tire pressure each year, in the United States alone. 43% of all tires in operation are driven on at least 10% below recommended values. That equals a tread wear rate increase of 16%. 7% of all commercial tires are running at least 20 psi below recommended pressures. Out of the 290 million tires disposed of each year, nearly 100 million tires are worn and dumped prematurely. What can be done to improve fuel economy, lower tread wear rate, and reduce our carbon footprint? 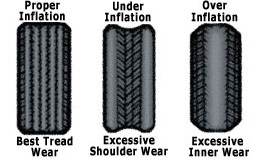 Check your tire pressure each least once a month and before going on long road trips. Make sure that your pressure levels are at recommended values and heed the TPMS warning symbol! If your light has turned on, limit your driving as much as possible until you can add air into your tires. If you have any questions about TPMS, email us at customer.service@tpmsdirect.com or give us a call at (714) 482-3996. Hey guys, we’re now offering new TPMS programming and diagnostic tools from leading TPMS tool manufacturer, ATEQ. This handy tool is absolutely essential for service bays and repair shops. The ATEQ TPMS Check Box is designed to allow shops to test sensors for defects prior to mounting them into the wheel. Simply insert any TPMS sensor on the market into the box, close the box, connect the air tube (supplied with the box), connect air supply with ATEQ’s calibrated air gauge, and compare the ATEQ VT55 tool with the reading on the ATEQ pressure gauge. Tire shops and repair bays are responsible for making sure the TPMS sensors installed on a customers vehicle are fully functional and free of defects. Releasing a faulty sensor on the road could be a costly mistake for both the driver and the shop. The ATEQ TPMS Checkbox insures that you’ll never release a bad sensor on the road. Now that’s peace of mind. The ATEQ Quickset TPMS Reset Tool is used to reset a vehicle’s tire pressure monitoring system when replacing sensors or swapping tire sets. The Quickset also comes with a “Swapping Tires” function, which assists you in tracking and recording the TPM sensor information after rotating tires. The ATEQ Quickset TPMS tool eliminates the need to make multiple trips to the dealership every year. Save time and money by resetting your sensor codes in the comfort of your own garage. The ATEQ VT30 is a universal TPMS sensor decoder. This sensor decoder comes with a built-in USB connection and internet synchronization software to ensure that the VT30 remains compatible with all future TPMS sensors. The VT30 triggers all mounted or unmounted TPMS and can turn the TPMS warning light off on the vehicle’s dashboard. The tool displays sensor data on screen and can also transfer data to a PC, in which results can be printed. The VT30 has a unique interface that is simple to navigate and easy to use. The ATEQ TPMS sensor database is classified by car manufacturer and is constantly updated. To decode a TPMS sensor, simply select the car make you wish to test and press the “Test” button.